A)What kind of technology is it? 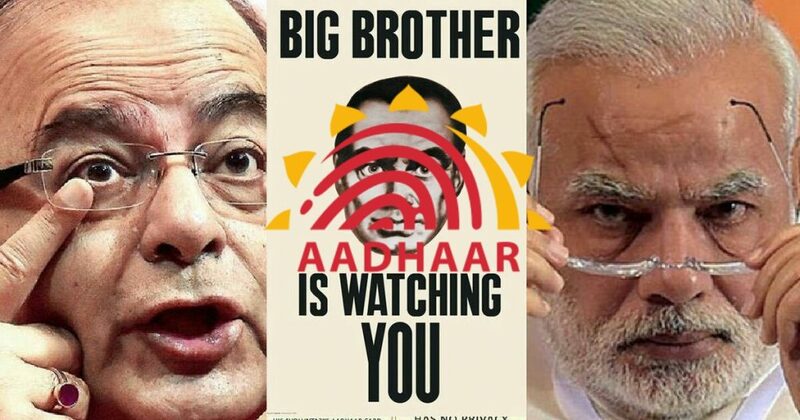 Aadhar is a surveillance technology masquerading as secure authentication technology. B) But at least it is not affecting anyone directly. Then why we should worry? C)Where we have to link it and what can be its effects? 1.You have to link it with your SIM card, pan card, passport, bank account, voter ID, college/university. And if you want benefits of schemes like LPG, MGNREGS, etc. you have to link Aadhar to them also. 3.Which also means authority with whom you are linking Aadhar can have access to your photograph (which doesn’t come under core-biometrics) and your demographic information which includes as name, date of birth, address and “other relevant information” of an individual. It explicitly excludes race, religion, caste, tribe, ethnicity, language, records of entitlement, income or medical history. 5.To be fair, two safeguards are in place in the Aadhaar Act. One is that the requesting entity must inform you about the use it proposes to make of your identity information. ( But who reads the fine print of the terms and conditions when buying a sim card, or before clicking “I agree” when installing new software?) The second safeguard is that the requesting entity cannot publish or display your Aadhaar number (or your core biometric information, but that is not accessible to a requesting entity in the first place). Note, however, that nothing prevents a requesting entity from publishing or displaying other identity information, as long as it has informed the concerned person. 7.The Clause 33 (2) states that an official with the rank of Joint Secretary or higher may access a person’s identity information including core biometric information if the official has an order issued in the interest of national security by the central government. The government has the power to know (or use) your fingerprints, iris scan for the “National Security”. D) If there are such serious loopholes, why Government wants to make it mandatory? E) So is it necessary to link Aadhar with gov schemes? 1.As per “Government of India rule”, yes it is mandatory to link it for six welfare schemes, PAN cards, and mobile phones. 2.Other than these, ALL other schemes/services/benefits for which Aadhaar is being made mandatory go directly against the earlier Supreme Court order. Including the bank account linking. BUT the government continues its assault unabated. Even the regulations they cleared under the act were quite illegal and had many many loopholes. This is where the confusion begins. F) Aadhaar violates the fundamental right to privacy or not? It was passed with shrewdness. First, it was introduced in the Budget session of 2016 as a money bill. But Aadhar is not a money bill in any sense. H) What are money bills then? 1.Bills which exclusively contain provisions for imposition and abolition of taxes, for the appropriation of money out of the Consolidated Fund, etc., are certified as Money Bills. And Aadhar has nothing to do with these things. Only the speaker has the right to called a bill a money bill, but in case of Aadhar, Mr. Arun Jaitley himself introduce it as the money bill. I)Why was it introduced as Money Bill? The Lok Sabha has majority members of ruling party but not in Rajya Sabha. Mr. Jaitley was aware that if this bill introduced as the normal bill it will be debated in Rajya Sabha. So after introducing it as a Money Bill, it will no longer under the control of members of Rajya Sabha. Rajya Sabha members can suggest amendments but Lok Sabha has every right to accept or reject those amendments. Guess what happens in Aadhar bill? J)How Government is trying to set bureaucracy (and not democracy) regarding Aadhar Act? For that, we take a wonderful journey all the way to Clause 58 on Page 17, to the very end of the oh-so-complicated-and-well-worded bill. (1) If any difficulty arises in giving effect to the provisions of this Act, the Central Government may, by order, published in the Official Gazette, make such provisions not inconsistent with the provisions of this Acts may appear to be necessary for removing the difficulty: Provided that no such order shall be made under this section after the expiry of three years from the commencement of this Act. This clause basically puts in a ‘lockdown’ provision. Before that comes into effect, they can make changes in the bill by notification in the Gazette ( a written record of bills which passed as an Act). Basically, bureaucrats will have a free reign over what this bill will do after it is passed by Parliament. And this is very serious. K) What is the role of ministers in this? Bhartruhari Mahtab (BJD) said the Supreme Court had said in September last year that Aadhaar is not mandatory and wanted to know whether the government was “forcing” people to get it. “Yes, we are,” Jaitley replied. L) So who is really responsible for this? UPA or NDA government? The Aadhar card or National Identification Authority of India Bill 2010 (NIDAI) was introduced by the then PM Dr. Manmohan Singh along with Nandan Nilekani as an optional card that wasn’t meant to be mandatory for all citizens. What started out as a simple identity card that would be provided to all Indians. The Aadhaar (Targeted Delivery of Financial and other Subsidies, benefits and services) Act, 2016 is a money bill of the Parliament of India. It aims to provide legal backing to the Aadhaar unique identification number project by making it mandatory for people who want benefits subsidies or schemes. Making Aadhar mandatory is illegal. (I have shown you all evidence about it. In future Government can ask for DNA of citizen as a biometric data. Shri Satpathi wants to know whether DNA can be part of it (Aadhaar).The act does not say so. Regulation can expand it.